Lucky Double Scratch Card Guide & Review - Casino Answers! 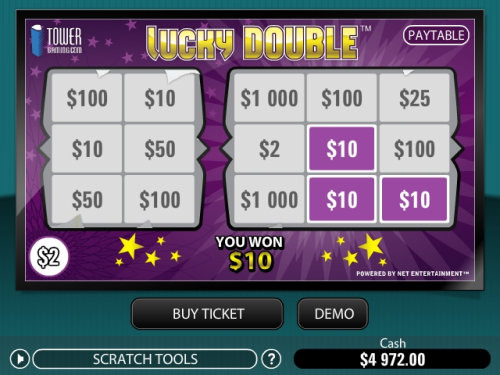 Lucky Double is an instant win scratch and win game developed by Net Ent. You can play the Lucky Double scratch card at Tower Gaming Casino and Casino Euro. 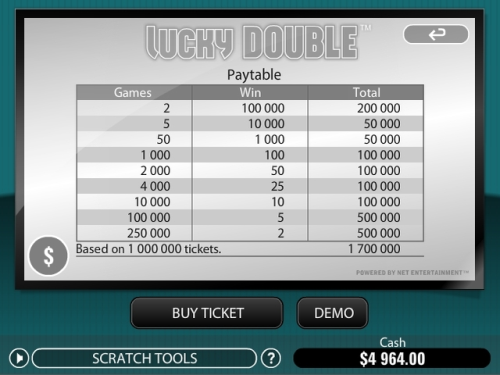 Every scratch card game of Lucky Double will cost $2 (or two units of your selected currency). To play, all you have to do is hit the “Buy Ticket” button. You will then have the choice of either manually scratching the scratch cards by holding down the left mouse button or using the “Scratch All” button for quick play. If you choose to manually scratch the card, you will be able to choose your scratch tool. The scratching comes with sound effects as well as animations for the shavings coming off the scratch card. You must thoroughly scratch both cards before the game will award your winnings (when applicable). You can also use the “demo” button to play a practice game. To win on the Lucky Double online scratch card, you must get 3 of a kind on one of the scratch cards. If you have three or more of a dollar amount over both of the cards, that will not count, as the two scratch tickets are independent from eachother. To play the Lucky Double scratch card game, get your 100% up to $100 welcome bonus when you sign up and make your first deposit at Tower Gaming Casino! Are USA players able to play the Lucky Double lottery ticket? Unfortunately, online casinos using the Net Entertainment software are not accepting players based in the United States at this time. For a selection of USA-friendly scratch card games, please visit Bovada Casino. Are Macintosh casino players able to play the Lucky Double scratch card? Yes, Tower Gaming Casino is the most Mac-friendly online casino around. Not only can Macintosh players use the excellent Instant Play Flash casino at Tower Gaming, but Mac users also have the option of downloading the Mac casino software. If you experience any issues with the Flash casino, please make sure you have the latest version of Adobe Flash Player installed on your computer. How much can I win playing the Lucky Double scratch card game? On the left ticket, you will be able to win up to $100. On the right side scratch ticket, you can win up to $100,000 playing the Lucky Double scratchie! Where can I play the Lucky Double Scratch Card for free? What online casinos host the Lucky Double Scratch Card? What Net Entertainment casinos have the Lucky Double Scratch Card?